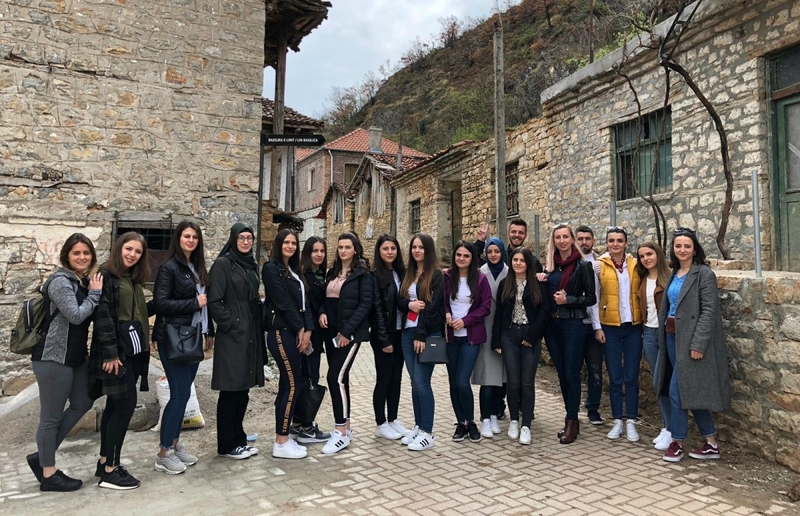 Graduate students of the study program of Sociology within the subject areas: Rural Sociology and Urban Sociology, led by the Assistant Prof. Ardita Abduli visited the village of Lin and the city of Pogradec of the Republic of Albania. The visit was carried out with an intention to directly observe the differences between village – city, to conduct sociological analysis and lifestyle in the villages of Albania. The selection of the village Lin, for a visit, was due to the fact that this village still continues to breathe under the umbrella of tradition, where agriculture and livestock occupy the main place in the economy of the village. Another sociological element of this village lays in the social relations of the inhabitants. This village consists of residents of two religious denominations: Christian and Muslim, and religion does not represent an obstacle to the marriage bond between them, so residents maintain friendship among them by visiting neighbors of other faiths during religious holidays as well. Among other things, the village is concerned in the recent years about being abandoned by young people. Meanwhile, the city of Pogradec, also known as the “City of Flowers”, except for being a tourist town which extends by the Lake of Ohrid, is also known for its ancient cultural traditions. Participating students in this study visit with educational character, besides gathering the facts from the observation, conducted several interviews with local residents about the conditions and social relations within the village, which they will reflect in their seminary work.